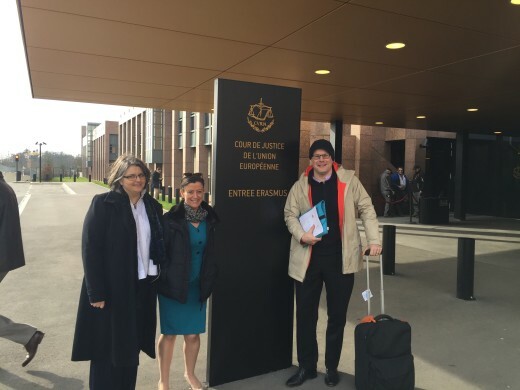 Congratulations to Wilsons partner Ana Gonzalez together with Counsel Thomas de La Mare QC and Bojana Asanovic who are appearing before the First Chamber of the Court of Justice of the European Union in the case of NA (Pakistan) following four questions referred by the Court of Appeal. who are appearing in the Court of Justice of the European Union on a free movement referral from the Court of Appeal. We act for a Pakistani national married to a German national. The couple married in 2003 and moved to the UK in 2004. The marriage broke down as a result of domestic violence. The couple had two children both of whom are German nationals. The marriage was dissolved by way of Decree Absolute on 4th August 2009. By that time the German national husband had left the UK. 1. Must a third country national ex-spouse of a Union citizen be able to show that their former spouse was exercising Treaty rights in the host Member state at the time of their divorce in order to retain a right of residence under Article 13(2) of Directive 2004/38/EC? 2. Does an EU citizen have a right to reside in a host member state under Articles 20 and 21 of the TFEU in circumstances where the only state within the EU in which the citizen is entitled to reside is his state of nationality, but there is a finding of fact by a competent tribunal that the removal of the citizen from the host member state to his state of nationality would breach his rights under Article 8 of the ECHR or Article 7 of the Charter? 3. If the EU citizen in (2) (above) is a child, does the parent having sole care of that child have a derived right of residence in the host member state if the child would have to accompany the parent on removal of the parent from the host member state? 4. Does a child have a right to reside in the host Member State pursuant to Article 12 of Regulation 1612/68 EEC (now Article 10 of Regulation 492/2011/EU) if the child’s Union citizen parent, who has been employed in the host Member State, has ceased to reside in the host Member State before the child enters education in that state? The Advocate General opinion is expected on 14 April 2016.